Jon heard Kara’s voice echo down the passageway as dust settled around them. A rock had fallen and rolled not far from Tam’s feet. Jon shivered and looked at the others. Ellea was still frowning. The remaining robed men stood around them, looking with dismay at the fallen rubble, and their comrades under it. 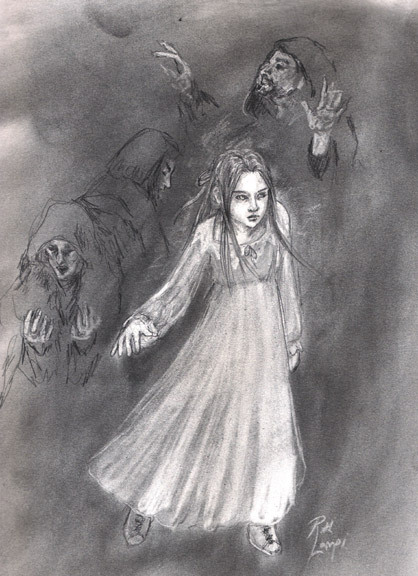 “Who shall I send after her?” The rotting man grinned at the children. One of his teeth was coming loose from his jaw, hanging by only a thread of flesh. “Send me,” Djaren said. He stood up straight, and faced the rotting monster, looking, to Jon’s eyes, very brave indeed. “No, no, young master Blackfeather.” The surname was pronounced like a curse. “I have other plans for you.” There was something dreadful in the way the rotting man said those words. Ellea gasped. She was staring at the rotting man with huge eyes, and a look of first horror, then hate. She whipped her head about to stare hard at the two men holding Djaren. First one and then the other took their hands off him, suddenly screaming. One ran back the way they had come, wailing, and the other fell to the floor, writhing and howling. Ellea and Anna’s captors were next to begin acting strangely. Ellea, free now, glared across at the men holding Jon and Tam. One let go to begin striking at his own body, wildly. Another fell over in a faint. “Run!” Tam yelled, pulling Jon along after him. Djaren ran over to his sister and picked her up. “Never!” he told her, wrapping his arms around her, and running with her after Tam, Anna and Jon down the rubble-strewn passage into darkness, away from the rotted man, and toward the pickpocket girl. “Not for any reason. You know that,” Jon heard Djaren’s tense, frightened sounding voice say, just ahead. “Stop!” The pickpocket’s whisper halted them. From the flickering torchlight behind them came the sound of the rotting man’s rasping shouts. “What is the next trap?” the pickpocket demanded. “The door didn’t say about any more traps,” Jon said, breathlessly. “Well don’t take another step forward. Your door is about to kill you,” the pickpocket hissed. “We should light a candle. Does anyone have a candle?” Tam asked. “I do, and matches,” Anna said. “But we can’t see,” Tam said. “I can.” The pick pocket sounded self-satisfied. “Got it,” Djaren said. He directed the others carefully about unseen dangers in the dark, and they pressed on after the girl, Kara. Ellea and Anna held Djaren’s hands, Tam held Anna’s and Jon held Tam’s as they traveled. Kara scouted ahead, telling them where to step, and when to duck low under something, and where the turns were. There was a tense spot a little later, where they each had to step in turn over some wire only Kara and perhaps Djaren seemed able to see. Ellea did it quickly and easily. Jon found the process nerve-wracking. Djaren and Kara walked him through it, then Anna. Tam’s turn was last. “Watch it!” Kara’s tense voice ordered. “I can’t keep my balance like this,” Tam said. 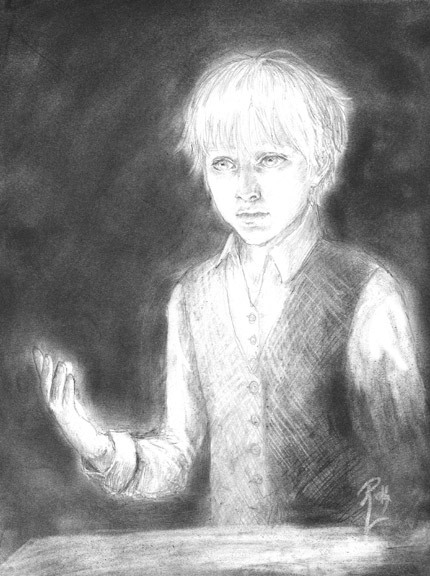 “I have your hand,” Djaren said. Jon was disturbed by the note of panic in his voice. “Careful,” Kara whispered, also sounding scared. Kara let out an exhalation of breath. “That was good. Good job.” Djaren’s voice sounded very relieved. They rounded another corner and abruptly stopped. Kara swore. “Is it safe to risk a light now?” Anna asked. The flare of Anna’s match illuminated all their dirty, frightened faces. She lit a long taper and held it up to illuminate a stone door, not entirely unlike the one that had led them here in the first place. “I thought you were supposed to be clever,” Kara said acidly. “We can do it. It will just take time.” Jon found his notebook in his pocket and squinted at the Sharnish words they knew. There were shouts down the passage behind them. “We don’t have time,” Anna said. “Get on with it,” Anna urged, before Kara could interject first. Kara looked a little surprised. “May he hold, or um, take a place among the, ah, ascendant, I think,” Jon added, perusing the Ancient. The sounds behind them were getting more disturbing, and ever closer. They stared at each other is dismay. A scream sounded quite close around the corner. Kara threw herself at the door with an angry cry. The stone moved back an inch. They all looked at it. “You just push it open?” Tam said. He set his hands against the stone and pushed. The door scraped open another inch. They all pushed together at the door then, as hard at they could. With their combined efforts, at last the door slid open wide enough for even Tam to squeeze through. “Now shut the door again!” Djaren ordered, after just one glance about. They all pushed as hard at they could from the other side and succeeded in settling the door back in its place. Tam slumped down to the floor to sit down, breathing heavily. “That won’t hold them,” he said. Anna lifted her candle, and the children looked around them. They were in a large room with no other exit. It appeared to be the tomb chamber of the ancient warrior. “We need more light,” Djaren said. Kara grabbed them from her and wound them around a stick of something she grabbed off the floor. They had the makeshift torch lit and blazing in moments, bright enough to light the whole room. There was a large coffin in the center of the room, surrounded by the decaying rubble of a hero’s burial. Bronze weapons were scattered on the floor, jeweled daggers and ornate spear heads. Flaking gold lumps marked ruined gilt chests and rotted wooden furniture. The air was old, and stale, but not as bad as Jon had read that the air in tombs could be. Anna reached down and adjusted her skirts, pulling a very nice boot dagger from its sheath. “I turned thirteen last birthday, and got my knife,” she explained, at Kara’s surprised look. Tam found two sturdy old bronze swords. Ellea bent down to look at an enameled statue. Jon himself was drawn to the coffin. It was rectangular, and grey, all made of stone. It was covered in scripts and carvings. In the middle of the lid the Ancient’s star was visible, encircled by the script of the Ancients. “We have to block that door,” Kara was saying. “Hold this high, alright?” Djaren handed Jon the torch. It was heavy, mostly something bronze. Jon held it as high as he could, and stood beside the coffin, where he could light most of the room at one time. Jon peered at the writing, curious, while Djaren, Tam, Kara and Anna shoved blades and spear heads into the cracks around the door, attempting to wedge it shut. “He served the One with honor,” Jon translated the words, and spoke them softly. “Let his brothers take up his memory, let his brothers take up his arms, and his shield. May his deeds be remembered and repeated in the war against the darkness. May those who come after be worthy.” Jon smiled. He had read the whole thing. He was getting better at this. He braced the end of the heavy torch on one knee in order to free a hand, and touched the star pattern. It unfolded under his palm. Something silvery and shining rose for a moment upon the stone, sending shivers through Jon’s hand. He pulled away, startled, and the silver came away along with him. Jon turned his hand to look at what was sticking to it. There was a lacy silver emblem, about the size of a pocket watch, cupped in his palm. It wasn’t a pocket watch though. Jon didn’t know what it was, but thought he’d seen it before in a dream somewhere. While he watched, amazed, it melted, or sank into his skin. A light tracery of silver lines lay upon his hand as if someone had tattooed the emblem there. Jon stared.